The antiserum was produced against synthesized phosphopeptide derived from human c-Jun around the phosphorylation site of tyrosine 170 (P-V-YP-A-N). 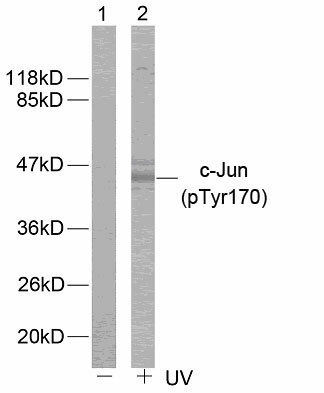 c-Jun (phospho-Tyr170) antibody detects endogenous levels of c-Jun only when phosphorylated at tyrosine 170. Barila D, et al. (2000) EMBO J.19(2): 273-281. Binetruy B, et al. (1991) Nature. 351: 122-127. Smeal T, et al. (1991) Nature. 354:494-496. Derijard B, et al. (1994) Cell. 76:1025-1037. Western blot analysis of extracts from HeLa cells using c-Jun (phospho-Tyr170) antibody (E011023).